Do you know what’s interesting about the current free-for-all for mobile operating system dominance? You guessed right! New entries! 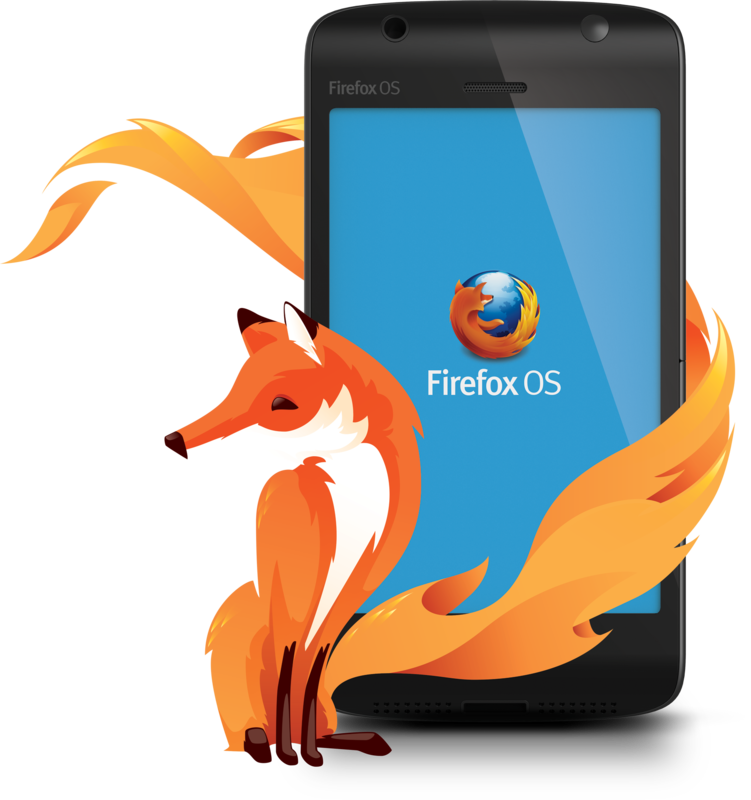 We are sure you have heard of The Firefox OS by Mozilla? Sure you have! 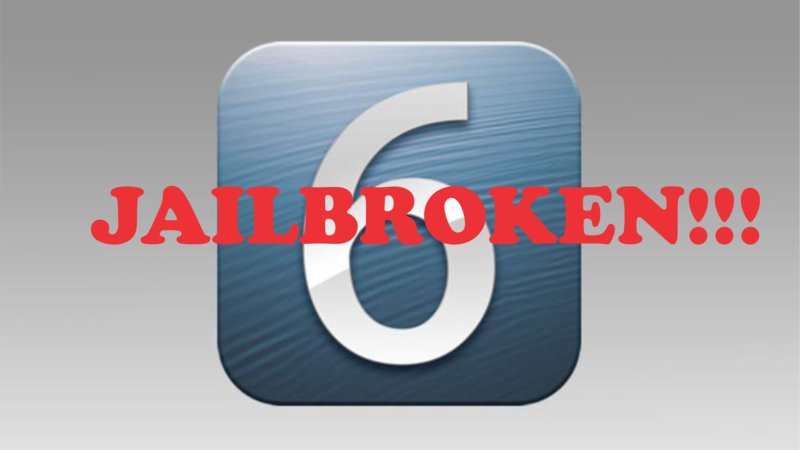 Launching a new mobile OS is a difficult project since the market leaders, Android and iOS, have such a big lead. Even Microsoft, with its near-infinite financial resources and vast ecosystem of complementary products, has struggled over time to gain traction. With the rising standards technology giants have set for themselves as they duke it out for market dominion, new entrants will have to face what I call a chicken-and-egg problem: developers don’t want to write apps for a platform without many users, while users don’t want to buy a phone without many apps. First off, to sustain any early momentum, Mozilla will need to convince developers to build Firefox OS apps. Firefox OS apps will be built entirely using HTML5. According to Mozilla, the thousands of developers who already know how to build Web apps will be able to build Firefox OS apps with minimal additional training. And because they’re built on open standards, Mozilla hopes that Firefox OS apps will work reasonably well on other platforms that support HTML5—which is to say, all of them. Thanks to ArsTechnica, we know the Firefox OS architecture has three layers, dubbed “Gonk”, “Gecko”, and “Gaia”. Gecko is the rendering engine at the core of the Firefox browser. Below Gecko sits Gonk, a bare-bones Linux distribution derived from Android. Above Gecko sits Gaia, a touchscreen user interface not too different from those found on other mobile operating systems. It makes sense that Mozilla would choose to make Gonk a derivative of Android because many device makers already know how to make devices that run Android. According to Mozilla “If you’re an OEM, you already have basically all the capabilities to run our system.” It is also worthy to note that since Firefox OS apps are essentially just Web apps, app developers are not required to use Mozilla’s app store at all. 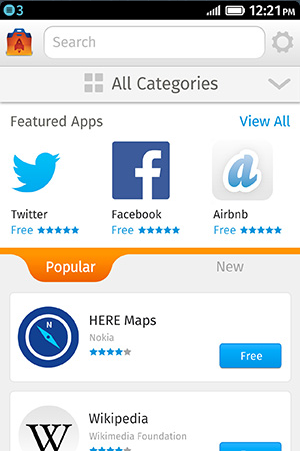 A developer can distribute a Firefox OS app as a “hosted app,” delivered from any Web server. Firefox OS looks familiar to anyone who’s used Android and iOS: when you turn it on, you’re faced with the familiar grid of apps. Swiping left and right slides in other pages of apps. And across the bottom of each page is a fixed set of four apps: the phone dialer, a text-messaging app, the Firefox browser, and the camera app. As with iOS, swiping to the leftmost screen launches a search app. But unlike iOS, this search app is wired not just to your own apps but also to the Firefox Marketplace and to the Web at large — remember, this is a browser-based OS. If you find an app you like in the search results, you can pin it to one of your screens for easy future access. 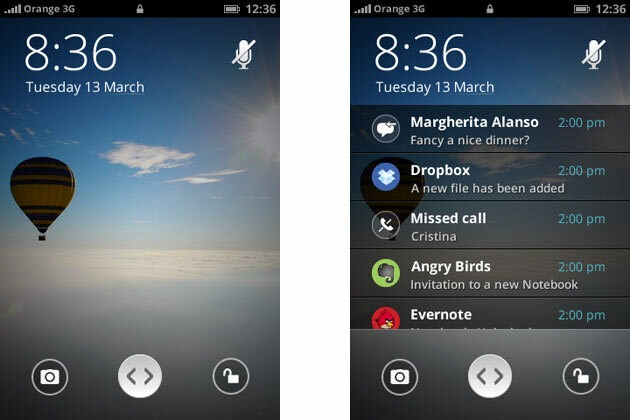 Firefox OS comes with a range of built-in apps such as Facebook and Wikipedia, and even mapping services. A long-press on the home button invokes a task switcher so you can juggle among open apps. 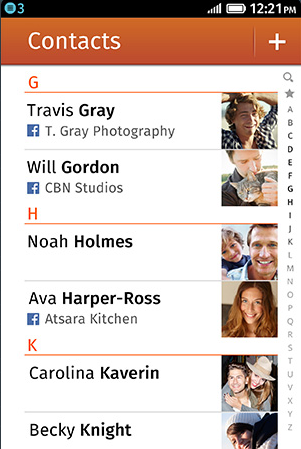 A contacts app lets you open up a screen full of information about people you know. It serves as a hub to phone them, send e-mail or text messages, or check their Facebook walls. Facebook integration also lets people import their contacts; Mozilla plans to add import mechanisms for services like Gmail, Yahoo Mail, and Hotmail — something it knows how to do by virtue of its Thunderbird e-mail software for PCs. A camera app, which also is accessible from the lock screen, has tabs for taking photos or videos, and it’s got a link to the built-in gallery app. That app lets you crop photos, apply some basic color filters, adjust contrast, and take actions like sharing photos on Facebook or by Bluetooth wireless networking. It feels so much like an earlier version of Android. It’s definitely good, though, that Firefox OS can get a running start in the app ecosystem by mobilizing the vast army of Web programmers — programmers who might well be happy they can reach Firefox OS customers without having to jump through nearly as many hoops as the Apple App Store or Google Play present. It is already available of several phones such as the ZTE Firefox Phone, Keon and Peek by Geeksphone. Firefox OS should be fully open to all by 2014 and if successful, it should change the way we use the Web. We are used to visit websites but Firefox OS will bring an era where we will be using Web apps more than Websites. 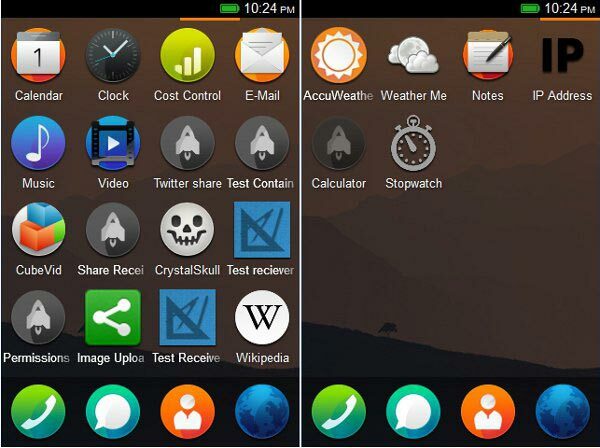 Ubuntu for Phones will also support Firefox OS to help bring in this change. Samsung Galaxy S3 mini – what to expect? We have seen the Samsung Galaxy S3 and we have argued over and over again about it being the best smart phone around. With its 4.8-inch screen, a gleaming oval design and a super strong processor, the Samsung Galaxy S3 is known for it’s value. Samsung has announced the release of smaller android mobile named the Samsung Galaxy S3 mini. The Samsung Galaxy S3 mini is nothing like the earlier Samsung Galaxy S3 in terms of performance. It is a mid-range android device with a 4-inch screen and it’s packed with a slower CPU without 4G LTE capability so we wonder about the point of calling it a “mini” version of the S3. The Samsung Galaxy S3 mini is just a tad smaller than the Samsung Galaxy S3, so, those hoping for a smaller Samsung Galaxy S3, might not get exactly what they wanted. The S Voice and DLNA sharing makes it different however, from other mid level android phones. The pricing of the phone wasn’t announced by Samsung but we can be sure it would be cheaper than the Samsung Galaxy S3: which may be why it is referred to as a “mini” version. You know times have changed when a relatively high-powered smartphone with a 4-inch screen is known as “mini”. The Galaxy S3 mini looks like a slightly smaller Galaxy S3. It is slightly thicker, measuring 9.85mm, compared with the Galaxy S3’s 8.6mm. The good news is that the mini is very light. The layout of the Galaxy S3 mini’s controls is similar to that of the Galaxy S3, but there are few notable hardware omissions such as the ambient light sensor and secondary microphone. Below the display you get the same three key capacitive menu, back buttons and a regular press home key. You will also find the earpiece, proximity sensor and a VGA front-facing camera for video-calls above the display. The omission of the ambient light sensor means that there’s no automatic brightness control for the Galaxy S3 mini. 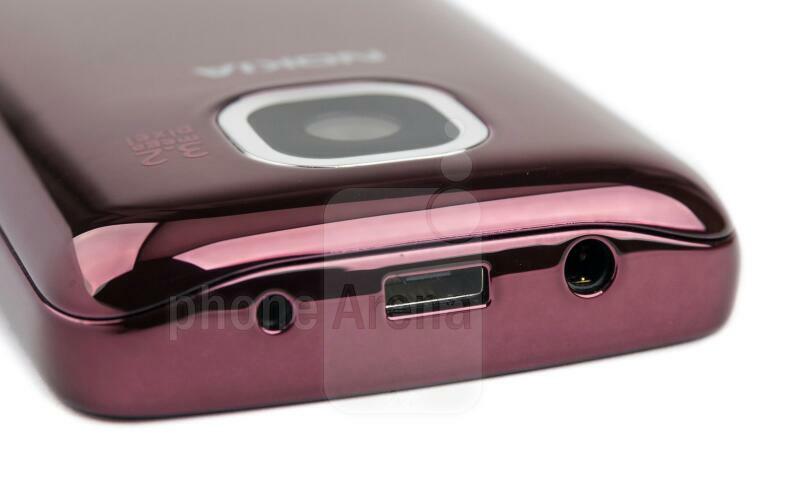 The volume levelers are located on the left side of the Galaxy S3 mini and on the right side there’s only a power key. I don’t think the Galaxy S3 mini will feature a dedicated camera key, since the original Galaxy S3 lacks one. The 3.5mm audio jack is at the top of the phone while the microUSB port sits alongside the primary microphone at the bottom and is used for both data connections and charging. Please note that USB host and MHL are not supported. 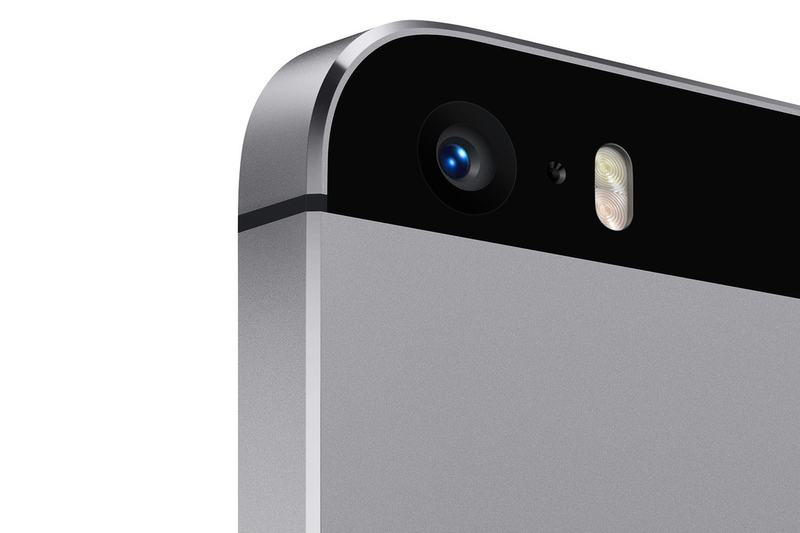 The 5 megapixel camera lens is located at the back of the phone. It has the LED flash and loudspeaker on it sides. The Samsung Galaxy S3 mini features a 4-inch Super AMOLED screen of WVGA resolution (800 x 480 pixels) and the pixel density clocks in at 233ppi. All in all, the Galaxy S3 mini display offers a more than decent image quality for a mid-range device. Colour separation is good and viewing angles are extremely wide. 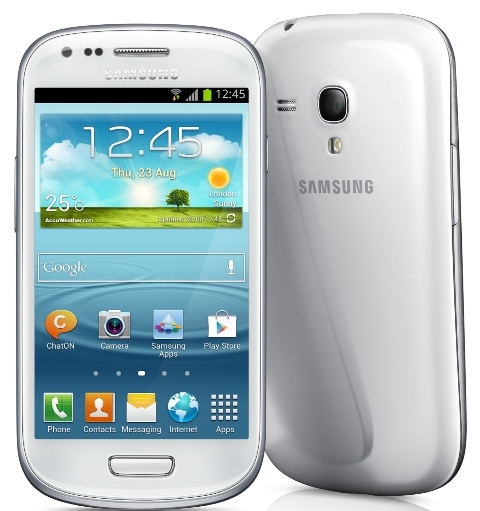 The Samsung Galaxy S3 mini is powered by android 4.1 Jelly Bean and the latest TouchWi user interface, dubbed Nature UX. It’s the premium combination that we saw on the S3 and the Galaxy Note II and it certainly will lift the stock android user experience. The mini features the tap and drag in any direction to unlock affair with ripples accompanied by water-drop sound as you drag your finger. 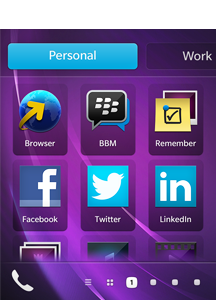 The notification area offers quick toggles for Wi-Fi, GPS, silent mode, screen rotation and power saving. Since the mini’s screen can only fit in five toggles at a time, you can slide them sideways to reveal more functions -notifications, mobile data, Bluetooth, driving mode and sync. The Samsung’s custom layer comes with lots of software extras, including photo-sharing features among networked phones and the excellent S Beam. There are other features in the Galaxy S3 mini like a lit screen when you glance at the camera and Digital living Network Alliance (DLNA) sharing that helps you transfer content like pictures and video between compatible devices. The Samsung Galaxy mini S3 features a dual-core Cortex-A9 processor with a 1GB RAM clocked at 1GHz. The single-core Mali-400 GPU manages the phone’s graphics which is good news for the 1,500mAh battery. The Galaxy S3 mini comes in 8GB or 16GB storage options (expandable to 32GB via microSD). With a processor like this, the Galaxy S3 mini is expected to perform most ordinary duties without lag. The Samsung Galaxy S3 mini comes with the default Jelly Bean Gallery, which has been treated to some TouchWiz flavor. It opens up in Albums view but you can choose to sort your pictures by location, Time, Person (photos with tagged faces) and Group. The Gallery also support highly customizable slideshows with several effects to choose from, as well as customizable music and speed. You can also highlight specific images to be included in the slideshow. When you view a photo with people’s faces on it, the Galaxy S3 mini will try to detect them automatically. The Gallery also features social tag. 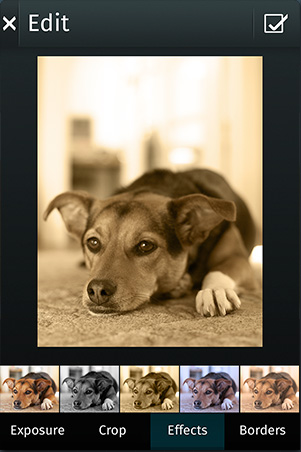 This feature works when a face is recognized in a photo. After recognizing the person in the photo, it makes you see the person’s status message which will allow you to call or message them easily. Also, there’s Buddy Photo Share. This function allows photos to be easily and simultaneously shared with all your friends pictured in an image directly from the camera or the photo gallery. 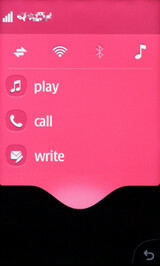 The Galaxy S3 mini makes good use of the same TouchWiz – Cald music player. Equalizer presets are enabled (including a custom one) along with Sound Alive technology, which features 7.1 channel virtualization. Music is sorted into various categories, but the most interesting one is called Music Square. 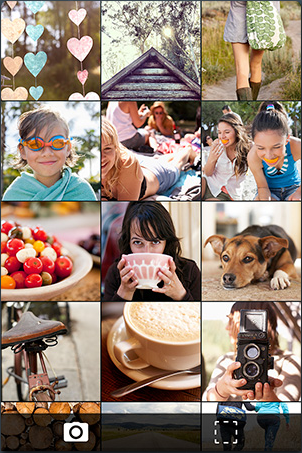 This feature automatically rates a song as Joyful or Passionate, Calm or Exciting and place those songs on a Square. The Galaxy S3 mini’s player is also DLNA enabled. The Samsung Galaxy S3 mini has a 5 megapixel camera and can capture photos at a maximum resolution of 2560 x 1920 pixels. The Camera’s interface looks like that of the Samsung Galaxy S3. The video recording of the Galaxy S3 mini isn’t top notch since it manages a 720p video recording. The Frame rate is 30Fps, this will make the captured video smooth enough. The Galaxy S3 mini is powered with a Jelly Bean version of the android browser. You also have options to download third party browser applications available at the Google Play Store. The Browser supports both double tap and pinch zooming along with the two-finger tilt. Zoom. There’s obviously the usual bundles of radios as well, including 802.11 a/b/g/n WiFi, GPS, GLONASS, FM radio, Bluetooth 4.0 (LE) and NFC, but for now, the Samsung Galaxy S3 mini will only support HSPA 900/1900/2100 networks along with EDGE 850/900/1800/1900. If you were expecting a Samsung Galaxy S3 with a smaller screen, this is certainly not it. The S3 mini’s hardware is far more modest than it’s “bigger” brother. There’s always a good side to every story; after all, it might be cheaper than the Galaxy S3. Apart from that, for a mid level android phone, the Samsung Galaxy S3 mini is a worthwhile pick. 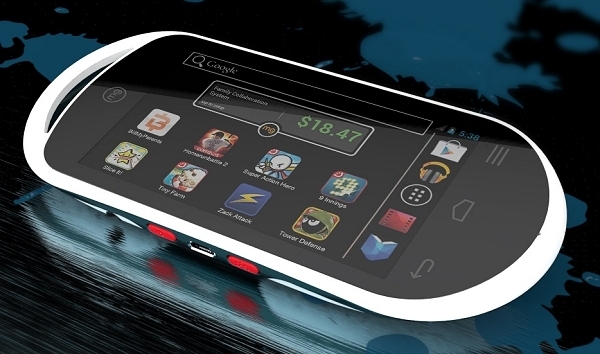 PlayMG has announced the sure release of a dedicated Android gaming handset which they call the MG. The device features full access to the Google Play Store. The MG is an Oval-shaped device which features a single-core 1GHz cortex A5 processor, 1GB of system RAM, a 4-inch Corning Gorilla Glass display screen, a 1.3 megapixel front-facing camera used for facial recognition, 4GB of internal storage (expandable to 32GB via microSD), a wifi radio and some amount of standard sensors like the gyroscope, compass, accelerometer and more. The device is powered by Android 4.0, Ice Cream Sandwich. A 1,880mAh battery which yields 3.75 hours of playtime and more than five days of standby. PlayMG says the device is lighter than a standard Android handset due to the fact that it lacks mobile phone internals. The MG device will come preloaded with a suite of games like Need for Speed Hot Pursuit and NBA jam (allows your kids to play with the device as soon as they unbox it), if they want other Games, they’ll have to visit the Google Play Store and spend some of their parent’s cash. This is where the MG‘s exclusive apps come in. PlayMG has created a family collaboration app that ties in closely with a service called BillMyParents, which provides families with a refillable debit allowance system for kids. The service itself isn’t exclusive to MG, but the in-app management system is. A widget on the device’s home screen keeps kids updated on how much money they have available, and an automated notification system keeps parents informed on how their kids are spending. For example, if Ade (kid) buys something inappropriate, his account can be locked down instantly via text message. The collaboration app also updates parents on how often the device is being used, what games are being played and more. The idea, is to trust, but verify that your child is making good decisions. The MG is built and design for the purpose of satisfying kids. It’s also an alternative gaming device to other portable games like the PlayStation Vita or Nintendo’s 3DS. Many thanks to Sean Buckley and Shawn knight for making this article a success. 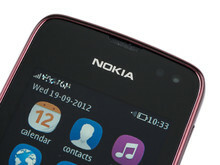 With the release of Nokia Asha 311, Nokia hopes to stay afloat in the market. 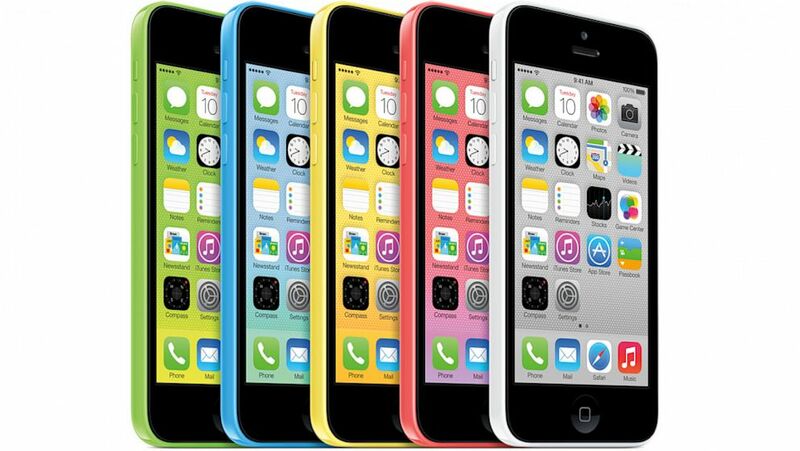 Asha 311 has a 3-inch low-res capacitive display and a 1GHz processor, both working together to bring the best out of the patched up interface of the series 40. Still as affordable as this phone is, competing with low end Android phones seems a tall task. Anyways, lets see how this phone performs before i make any conclusion. There’s nothing really great about the design of the Asha 311. 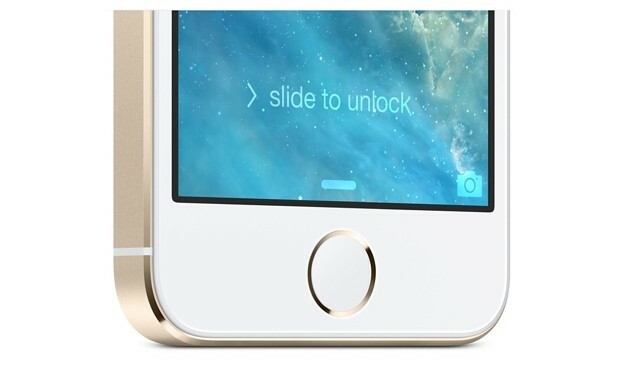 The features which the phone easy to recognized are the two physical buttons placed just below the screen. I wouldn’t say it adds much to the beauty of the phone, but the two physical buttons are very responsive and easy to press. The side keys are nothing like the front buttons. They are too ridig, too nard to press making it uncomfortable. Nokia still featured the traditional pinhole charging port which is located on the top of the phone. There’s also a microUSB port and a 3.5mm headphone jack just beside the pinhole charging port. 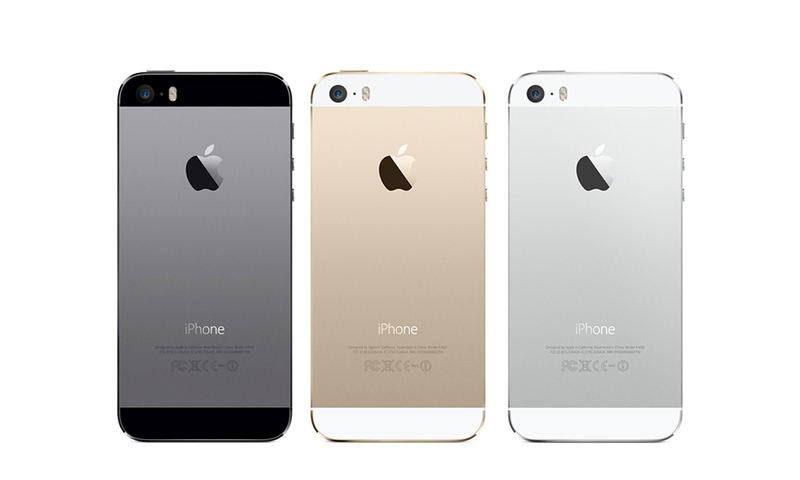 Finally, the phone feature an ambient light and proximity sensor which becomes active during calls to dim the screen. The Asha 311 is one of the best in its family. 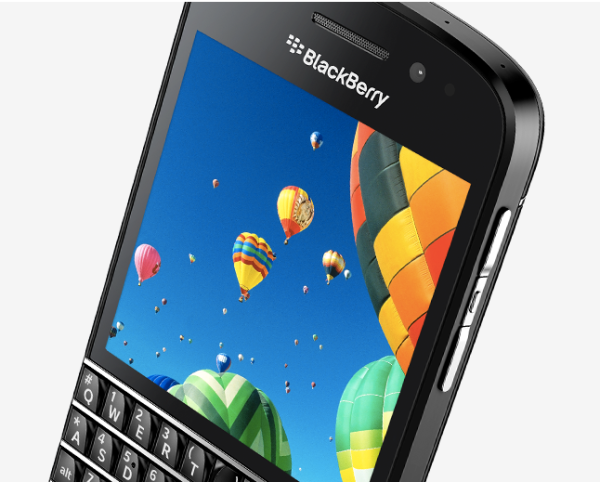 It has a capacitive 3-inch LCD display screen with a resolution of 240 x 400 pixels. 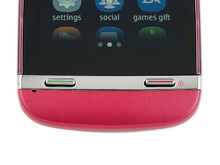 The good news here is that the Asha 311 comes with a Corning Gorilla Glass which protects it from scratches or scrapes. It also support multitouch. Nokia added a polarizing filter for betteer outdoor visibility (outdoor visibility performance is average). 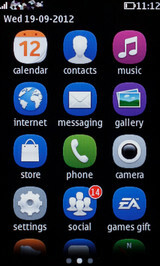 The Nokia Asha 311 comes with the Series 40 interface. There is an imitation of the Android OS dropdown menu, three swipeable home screens and an imitation of the IOS notification icon. Nokia made a little improvement on the user interface by adding a bouncy effect for icons whenever you scroll to the top of a list. I would say Nokia made an effort moving a step forward with the Asha 311. 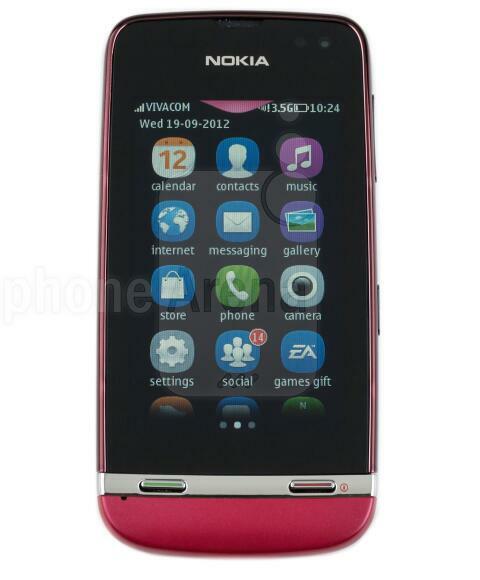 Compared to the other Asha series, the Nokia Asha 311 is fast. 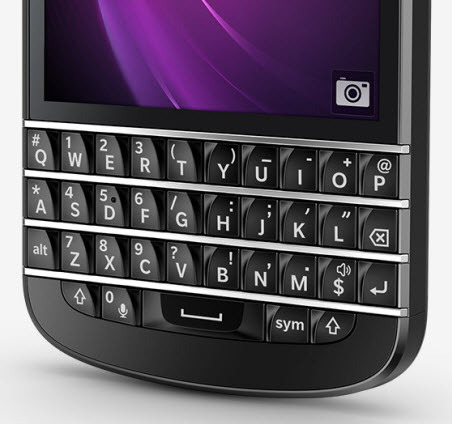 All thanks to the more responsive capacitive touchscreen, but also to the RAM memory (128MB) and a 1GHz processor. 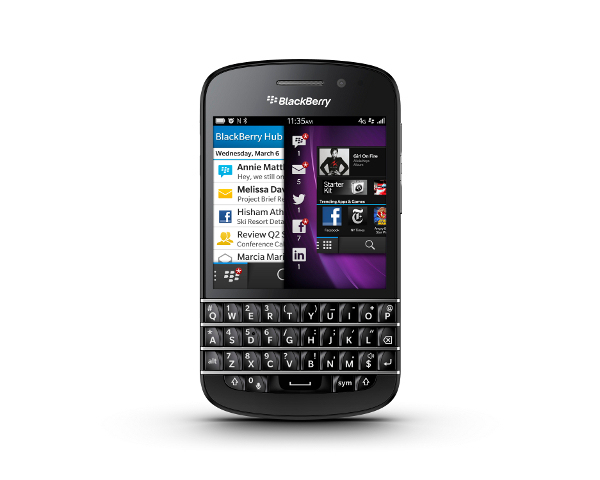 The phone comes with a 2GB microSD card, internal storage of 140MB and can take up to 32GB microSD card. The Asha 311 has a 3.2 megapixel camera with no flash. It a fixed-focus camera with very low quality shots. The good thing is that the camera is very easy to operate. It also captures video in 480p recorded in .3gp format. The frame rate is 25Fps and it’s not that good for recording fast-moving objects (Great…how on earth can i record Usain Bolt’s race!). Finally, the Asha 311 can also boast of something; longer battery life. It’s packed with a 1100mAh Li-ion battery that yield 6hours of 3G talk time, 14hours of 2G talk time and up to 40hours on music play time. I’ve had a look at the Asha 311 from all angles but I’ve been kinda silent on the most important part which is the price. In Nigeria, the device costs between ₦18,840 to ₦23,550 ($120 to $140) depending on the market. This pits it in the same category as low-end Android smartphones like the Galaxy Y, Galaxy Pocket and LG Optimus L3 (cost either the same or lower than the Asha 311, but bring you into the smartphone land with lots and lots of useful apps unlike the java apps you get on the Asha 311).If you are a Game freak, you have to consider the options but the Nokia Asha 311 is a very good phone (for my mum, dad and little bro since they’re not that borthered about classy apps or games). On its own the Asha 311 stands proud.